Birmingham-based Coleman & Company Limited have launched a new website to showcase their full range of services. This new site now covers just about everything we provide as a company and we look forward to hearing feedback from both existing clients and new website visitors. Birmingham-based Coleman & Company Limited have launched a new website to showcase their full range of services. The demolition contractors, who also specialise in land remediation and specialist cutting services, have undergone an overhaul of their online presence to demonstrate their full capabilities in engineering as well as applying the latest web technologies. 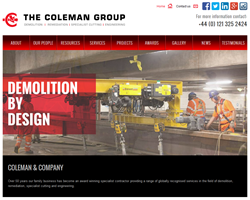 The new website features prominent service sections to illustrate the expertise of the various divisions within the Coleman Group including Eneotech – the group’s environmental services arm and Coleman & Company Specialist Cutting Services, which specialises in diamond cutting and structural alterations with a particular emphasis on working in high risk environments. Coleman & Company were incorporated in 1962 by John and Norah Coleman. Originally established as an excavation business, the organisation has now evolved into an award winning group of companies that work with clients across the UK and overseas. Anyone wishing to view the new Coleman & Company website or to find out more information about the company and its services can visit http://www.coleman-co.com.